A mousse is a prepared food that incorporates air bubbles to give it a light and airy texture. It can range from light and fluffy to creamy and thick, depending on preparation techniques. Fruit mousses are typically made with whipped egg whites or whipped cream and generally flavoured with chocolate or puréed fruit. There are many variables in terms of recipe, process and finished product characteristics for acid, fruit mousse, including high fruit levels (pure fruit), cream content, aeration level, and texture and mouthfeel. If you are developing a new product, we would be pleased to offer advice and support, get in touch today. Our team of experts can discuss and advise on these points with you, to ensure you obtain the optimum product for your recipe and process. 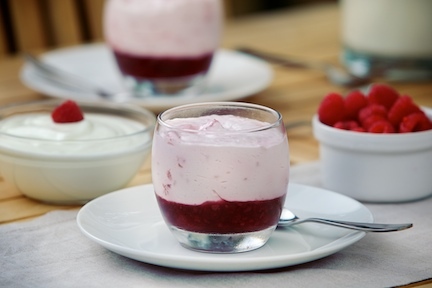 We can help you cost optimise your fruit mousse recipe to ensure your profit margins are kept as high as possible. The main commercial benefits of whipping come from the addition of air as an ingredient – which for obvious reasons isn’t one with associated high costs. Depending upon the recipe and whipping equipment available it is possible to obtain up to 200% over-run in the whipped fruit mousse product. Our technical team will be happy to advise you on the best way to keep your recipe and production costs down.